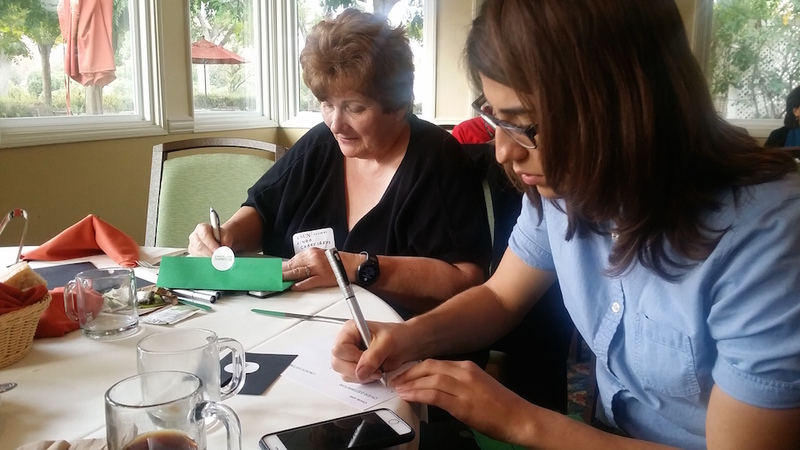 CSUN Klotz Health Center Director Linda Chassiakos and CSUN Academic Technology staff member Hannah Luna participate in an activity led by the speakers. Photo by Hansook Oh. CSUN psychology professor Abe Rutchick speaks to attendees at the Breakthrough Breakfast. Photo by Luis Garcia. Attendees participate in an exercise led by the speakers. Photo by Luis Garcia. 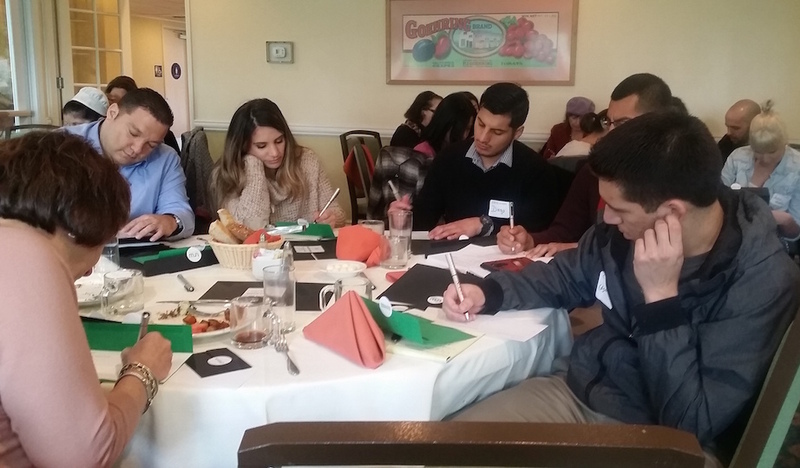 The entrepreneurship speaker series took place at the Orange Grove Bistro on campus and was organized by the David Nazarian College of Business and Economics, the Los Angeles Cleantech Incubator at CSUN (LACI@CSUN), the Tseng College and the CSUN Office of Alumni Relations. Andrew Chizever, vice president of the marketing research firm Lieberman Research Worldwide (LRW), and CSUN psychology professor and LRW consultant Abe Rutchick engaged participants with a lively presentation called “Leveraging Psychology for Business: The Five Things You Need to Know.” The speakers explained the psychological motives behind consumers’ choice of one product or service over another — to help business owners and entrepreneurs leverage those consumer tendencies. Understanding how human beings develop expectations and conceive of the future can be beneficial to people in business, said Rutchick, a social psychologist who studies how context affects individual behavior. 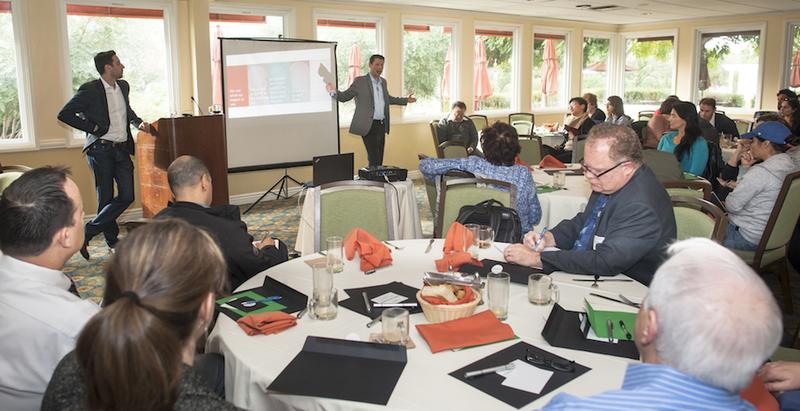 Chizever talked about how businesses can appeal to people’s self-perception when selling a product or service. The breakthrough breakfasts were launched by Alumni Relations, LACI@CSUN and the Tseng College in December 2015 to help spur a culture of innovation and entrepreneurship between faculty, staff, students and alumni. Debby Schlesinger, a registered nurse who attended the breakfast with her husband, who is an alumnus, said the seminar was informative and relevant to her field. Deborah Heisley, professor of marketing and director of graduate programs in business, said it was beneficial to see faculty involvement in the breakfast seminar. Rutchick said giving the seminar as a faculty member to a mixed group of faculty, staff, alumni and community members was a valuable experience.